Spigot 1.13.2 is the core of any Minecraft Hosting and Network setup. Spigot allows your server to use plugins in the same way that Bukkit does, Spigot is default in our BungeeCord Network hosting package. Automatic conversion between online and offline mode. 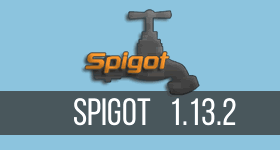 Start a free trial of Spigot 1.13.2 right now for 24 hours. To avoid lag or memory errors, order a minimum of 1GB of memory. If you are playing with friends or planning on hosting a public server consider ordering 2GB or more. You won't know your exact requirements until you start building and getting more players on. Don't worry you can quickly upgrade your memory as your server grows. Follow this guide if you need to upgrade.